As I sit by the fire, the stars up ahead, the city back in the distance, the race now a memory, friends on either side, I’m touched by the outpouring of support and celebration that has been the 2014 Boston Marathon. 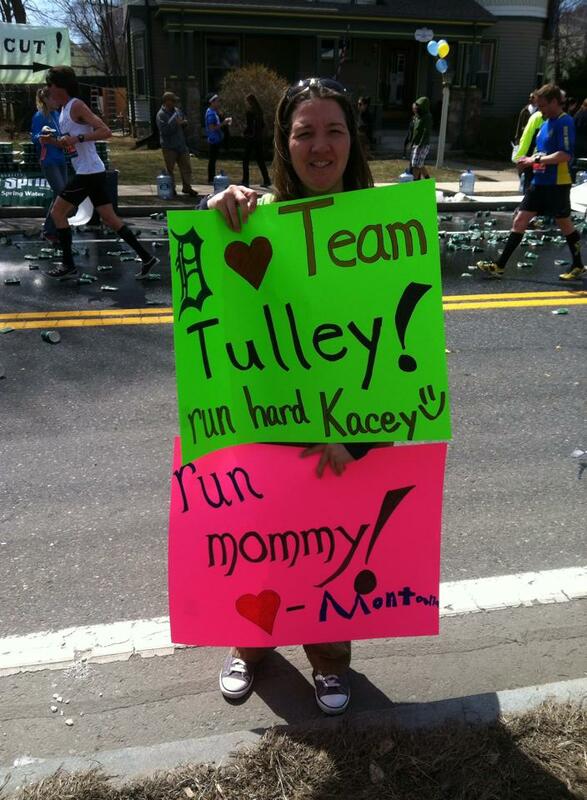 The Boston Marathon was everything I could have imagined it to be after the events of last year. I have been emotionally touched and inspired since the moment I registered for the race. It’s a course that I always describe as “deceivingly tough” and that was in every way the truth this year as well. The city was tested last year by the acts of two cowards…..I don’t think they had any idea just how tough this city really is; runners do though. From the moment I got off the plane I have been surrounded by love. Love from my friends that hosted me. Love from the celebration for Colonel Spain I had the honor to attend and meeting some of the survivors and a family of a lost victim of last year’s events. Love from everyone who shared a common passion and a love for the run. Love from friends who had flown in to the town to share the experience. Love from friends who generously hosted dinners to bring friends together in celebration. Love from the countless texts, messages, calls, and e mails to let me know that I was in their well-wishes. Love from my daughter who was torn with wanting me to win the Boston Marathon yet at the same time wanting me to come home to her. 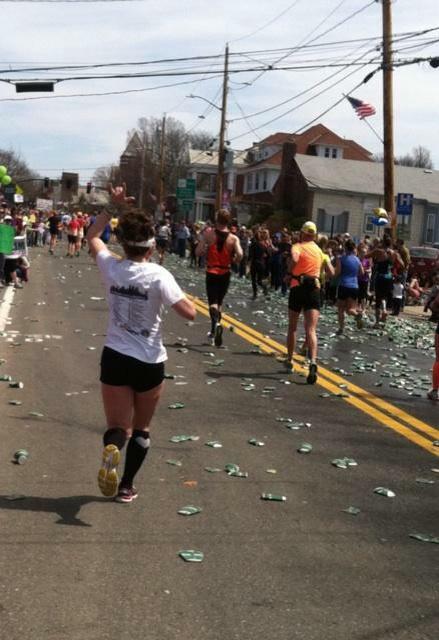 Love from the crowd who emerged to line every inch of the 26.2 miles trek….often several people deep. Love from those back home who have trekked some miles in a relentless winter with me. Love from my friend and therapist Steve at Tri-Covery who helped me over-come what I thought was going to be a run-stopping injury to even be able to consider toeing the line. I was asked if I could describe the Marathon and it’s a bit like describing the multi-layers of the roaring crowd along the Boston Marathon route. There is no quick response. This year I toed the line on a warm day to begin my journey into town at 11:00 am. The sun had been shining all morning and everyone was in amazing spirits. It was going to be a tough run in this sunshine and warmth, but at this point there is only one way to get back into Boston. 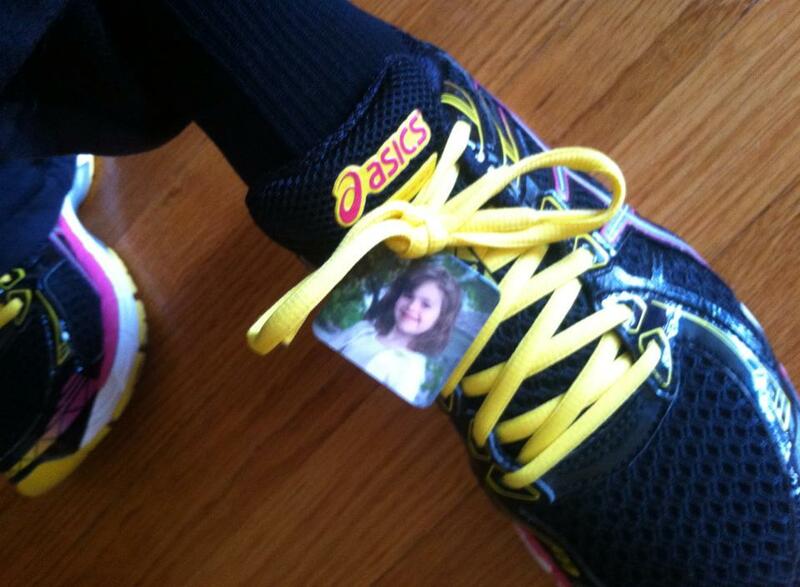 My daughter Tana and my Tulley Toes ready to toe the line at Hopkinton. I stayed calm and enjoyed the crowd, I knew from the beginning that this was going to be a day to not only celebrate each step that got me across that finish line on Boylston, but I was going to earn it fare and square. I’ve run a lot of miles on a lot of courses, but there is just something that this course does to my legs and today was not going to be any different. I started to feel twinges in my quads at about mile 8 and knew I was going to have a tough day as far as running goes. I gagged a few times between mile 8 and 9 and I really had to think through what I could do with what I had that was going to allow me to get my own self across the line. After watching a weekend of fighters be honored and celebrated there was no way I wasn’t going to get my own Tulley Toes across that line on Boylston Street. I stayed calm. Found some salt tablets, took a banana from the crowd and a wet towel from a little girl who looked about my daughter’s age and kept on keeping on. I wanted to keep crossing the mats at a decent time, not falling too far off of what I was hoping for was an 8 min pace, because I didn’t want anyone to worry. 26.2 miles is a long ways to go and a lot of things can go wrong. I knew the world was watching and at the end of the day it’s suppose to be fun so I hate for people to worry. I knew many of the landmarks and sure enough, there were staples that no cowards could rock. The man with the chalk board was still there. The Sox hadn’t scored when I ran by. The motorcycle bar was open and flowing with beverages and cheer. The kids sure enough were jumping on their trampolines, smiling and screaming words of encouragement. The Wellsley girls were louder than I have ever heard and offered a great push that signaled half way there. The crowd was relentless. I saw plenty of people who were having tough days and there was no shortage of encouragement. As some of the pictures show, there were literally people willing to carry others across the finish line. I made my way to the Newton Hills and dug deep to get up, and then up, and then up some more. You level out for a bit and then you go up and up and up a little more. There was a mega-phone man at the top who was announcing the “you’re at the top!” and there have been no sweeter words. At this point I had stumbled a couple of times with my legs doing what runners may call seizing up. I’m no stranger to this feeling on the Boston course. It’s the only place in my running miles where I have ever felt this and today wasn’t going to be any different it would seem. I never wanted to walk and even though I stumbled I never walked – I just wasn’t going to. I know the course was tough, but I was going to find a way to be tougher. I kept trying to push. My mind wanted to go stronger, go faster, but my stomach and my legs would only go in and out of cooperating. I have a habit of picking the not-so-easy road and today was no different. This was no course for people not up for a challenge and so I embraced that, kept my mind in tune with my body and continued to push as much as I could. Nettie Holding the signs she and Dawn made and the one my daughter, Montana made. I’m so glad I had a moment of clarity in my haze as all three of us started to wave with excitement! I desperately wanted to stop and hug them but the crowd was thick and I was in too much pain for stopping and starting. I veered near them, waved, and signed I Love You as I continued my run down the road. Once again, just enough to be enough for the next stretch. Boston Sign I Love You as you can read the intentions on the back of my shirt whom I love dearly. The day was so joyous and full of humanity over-coming. I saw people along the course crying. Pulled over with cramps unable to go on. I saw people high-fiving the crowd along the way. I saw three men who were missing limbs running side by side. I wasn’t behind them for long, but long enough to know that the one in the middle was hurting. The two on either side of him were giving him a back pat and words that I can only imagine. I’m certain that whatever it was that brought those three out to run, they weren’t going to quit, this was merely a hiccup in their story of over-coming. I knew I was going to make it. Mile 22 and 23 were terrible. At mile 24 I heard my friend play in my head, “anyone can do two miles.” I was coming up on tons of runners at this point. Many of which who were having rougher days than I. I kept pushing. I’ve been on this road leading up to the turn before Boylston street and I knew I was getting close. There is a park on the left and a tunnel that is old-world beauty, today made even more beautiful with a sign that said 1K To Go! I knew I was going to make it. Oh I know I still had plenty of steps to pedal, but rush of the crowd, the positive intentions of the prayers of all those knowing I was out there and getting close, my own determination, the screams of the crowd just made the pavement a little more springy. I turned the corner on to Boylston and as I was looking up to the see the coveted finish line, I heard my name. My dear friend Rick was at the turn yelling out. I blew kisses and choked up one more time. I took a breathe and then found a gear that I didn’t ever know I had, and brought myself across that painted strip with dignity. I had, for the fifth time, crossed the finish line at the Boston Marathon. What a dream come true to be a part of the biggest celebration of love, life, and the pursuit of happiness over madness the world has seen. This entry was posted in Uncategorized and tagged 26.2 miles, Athletes village, Boston Marathon, Boston Marathon 2014, Boston strong, Boylston street, Marathon, Race, Run together, Running. Bookmark the permalink. Kacey, I also am from Michigan and this was my 8th Boston. I knew early on it was going to be a tough day and continue to try and figure this darn course out, but think it has my number. Your race story sounds so much like mine it is crazy. I was determined not to walk, which I accomplished, but the pain was at a high level. I have walked on the Boston course before and this time was not going to be one of them. I cut the race into 5K’s since I also knew where those timing mats were and knew friends and loved ones would be watching:) Congrats on an awesome achievement! Dan O. from just outside Grand Rapids. Dan, thank you for reaching out to me. It gives me some sense 😉 that I’m not crazy!! Glad you were able to dig deep enough to be enough for that day!!! And really……yah!!!! We ran THE Boston Marathon!! I just read this post for the first time. What a an incredible journey you took us on with this post. Another example of your brilliant writing about a bucket list event. Some day I hope to run Boston also. Regardless if I ever do, I already feel like I have experienced it through your writing and this post. Very, very inspirational. You are a talented runner Kacey and a remarkable writer. #keepgoing. Thank you……it’s within your pace to be your race! You’ll love it, and the journey to it!